Bhagwan Shri Vishweshwaraiah was the last son among many children of their parents. Both the mother and the father were great yogis. The father took upon himself the death of his eldest son from T.B. and offered his remaining life to him as Pranadana. Themother taught the last son, Vishwa, the secrets of yoga to cure himself of near-total blindness when he was about ten years of age. Vishwa did not prove himself to be a scholar like his brothers. He started spending his time meditating in cremation grounds, at the same time performing his duties as a textile inspector. With time, he engaged himself in teaching music, yoga and vedanta. He became devoted to Sri Chidambar Swamiji of Gubbi. Vishwa’s mere blessings were enough to change people’s lives. Thousands came to take solace and inspiration from his life. For them, just being with the master was a feast and a great meditation. Many sanyasis would come to his home which was open to everybody. He ate at home only when saints came home. Otherwise, he would go for bhiksha in the afternoon to some devotee’s home. Every day, he took alms. When he was working in the Sri Jayachamarajendra Technological Institute at Bangalore, devotees would bring him the afternoon food. He lived on whatever was offered in love. Whatever he earned, he gave to his wife, who resented him giving away all he had to others. Whoever was with him felt totally taken care of, as if by a father. He answered people’s questions through narration of stories. The stories had deep teachings which each person understood at his own level. He did not tell anybody what to do, but would simply tell them a story. He would bless everyone, telling them,“I will send your wishes as my prayers to God. May God bless you”. People felt that Bhagwan's blessings were enough for them to succeed in their endeavours. He would take people’s diseases. When asked, ‘‘Why are you taking it?”, he would laughingly say,“I am rich in prana, I can loan some of it to others who are suffering”. He gave every breath of his life to seekers and devotees. He hardly slept. Everyday, he would sleep around 11 P.M. or 1 A.M. and religiously get up at 2.30 A.M., for bath, japa, yogasanas, pooja and music lessons. 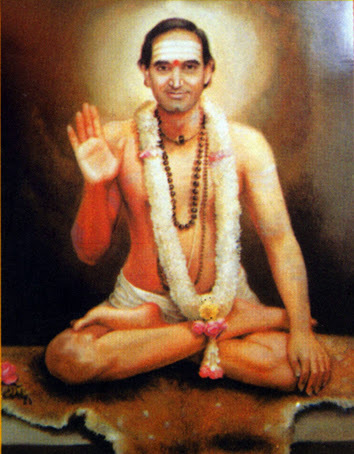 Bhagwan was a Nada yogi. Musicians would come to do seva and get his blessings. He has composed many kirtans and bhajans. These kirtans are very dear to his devotees. Bhagwan left his body on 7th March 1988 at the age of 66. Thousands came to have a final darshan. He had become an integral part of the state of Karnataka.
" Tracing our Tradition of Masters "